For the record, who's answering the interview? I’m Noël and I’m the lead & rhythm guitar on the Spanish thrash metal band Abductum. What is your band's name? How did you come up with that name? Abductum, …we wanted to focus on a particular theme related with hidden and arcane mysteries which science and conventional archeology refuses to recognize, then one day I been thinking about extraterrestrial, abductions and historical references in this regard, and I proposed Abductum, this latin name gives the band concept a close relationship with the ancient times where there are many references to this topic. So who's in the band and what instruments do you each play? Ok we are are four members from Granada (Spain), line-up is just my brother Javier Puente (vocal), Francisco Molero (Kiski) (bass player), Mario Jiménez (Drums) and me Noël Puente (on the guitars). How would you describe your sound. What makes you unique? I think there is so many new bands that considerate themselves like real old school thrash but they are crossing the further door in this sense, I mean we are not playing the music supposed to be offered, and of course we are not looking to modernize our personal sound because our songs flow under clear 80’s thrash and heavy metal influences, in our music you can find speed riffs and so heavy melodies and at the same time cool sound and honest feeling. What bands have influenced each of you? How experienced are you on the stage, a virgin or whore? Hmm, until now we played in some few shows and local metal festival because Abductum’s history is relatively short but now the band is working in a good way to be on stage everywhere just promoting our new album for sure. Anyway each one in the band have a great live experience because we played in many others band before. How would you describe your shows? There’s always a ton of energy though, great felling and honest sound and attitude. Tell us about your favorite show and why? Tell us about your worst show and why? Well, I don’t remember a really bad show, at present time I have good memories of all live concerts, but I guess that each one of them have a lot of positives and negatives details, I mean few things sometimes you can’t control, but we always try to keep professional attitude in front of possible problems like this. Tell Us About Your Dream Show, who you'd like to play with and where? We can think of several bands we'd love to play with, of course it’s so important to play beside big bands and big festivals but sometimes it’s not the matter, the priority Abductum wish is just to play anywhere to let people know about our music, if it’s a big metalhead’s place in which we can expand and increase our recognition…then great! Do you have a street team and how can you join? Do you have a record label and if not are you looking for one? At present we don’t have it, we produced this album by ourself, maybe there is any interesting option in the future, if this is the case we’ll consider it for sure. What are your plans for the future, in a year, 5 years? Just to growing up like musicians and see the fans growing up everywhere, we would like to look back in the future and see that all work we did was for something great. 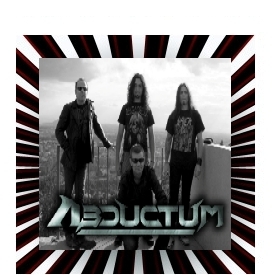 I love to see some band was getting bigger from really hard early days, and that’s the way Abductum want to follow. Finally, do have any words on what Arm The Pit means to you? I knew about this website, and I think is amazing there is places like this, it’s a big support specially to the bands which started now their way.